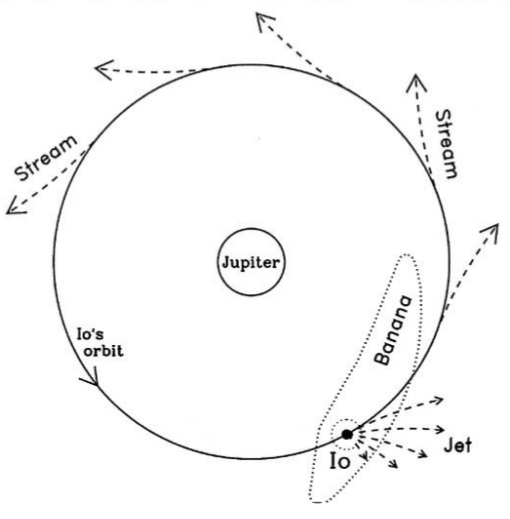 RkBlog :: What about imaging sodium and sulphur clouds in the Jupiter - Io system? Io volcanoes provides thin atmosphere around the moon than is then hit by solar radiation as well as Jupiter electromagnetic fields. 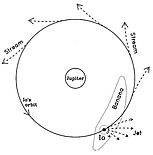 In result around a ton of ions and electrons per second leaves Io atmosphere to end up in Jupiter torus shape ring of plasma. Those sodium clouds or even sulphur in the torus ring can be photographed by normal cameras. I didn't found any amateur made photograph of those clouds yet, however the discovery of those clouds was made with relatively basic equipment - early CCD cameras and lenses (for the big nebula) and later on with telescopes (the small clouds around Io). Professionals will tend to use infrared bands that our cameras can't use but still we can use the original ones at 589nm for sodium and 673nm for sulphur. We need a narrowband filter that will cut down as much of light reflected by Jupiter while keeping cloud emission intact. In case of sulphur torus it's easy - use [S II] narrowband filter. In case of sodium a custom filter must be used. Such filters can be found on ebay on Omega Optical related shops (bjomejag and omegafiltersebuyer2) or in shops like Edmund Optics or Thorlabs. Some filters may be small or have relatively wide band so you will have to work out the filter cell or imaging settings on your own. And you can also use the sodium filter to photograph helium emission in some emission nebulae. On lafterhall.com there is sodium cloud captured on a spectrogram so it should be doable taking into account that it's somewhat doable to catch Amalthea - a 14 mag moon orbiting closer to Jupiter. Just a matter of processing and capture settings - that have to be tested by trial and error. My Amalthea settings are to use max gain and exposure so long that Jupiter is barely overexposed (so in result still very fast framerate). I then take some AVIs (in case of a point object barely stronger than noise more than one AVI is needed to verify), stack and over-sharpen. Then push the level to reveal grainy noise. If Amalthea is there it will appear as a bit stronger than noise grain point that should be in the correct place and move on orbit between clips. Sodium clouds are much easier to confirm by their unique shape. A planetarny coranagraph would be even more handy but that's a tale of another very expensive piece of equipment. If there is a chance to photograph the clouds then it may have some added scientific value as their intensities is related to Io activity and maybe even other processes taking place in the Jovian system. Analogue CCTV cameras designed for cheap and mass surveillance systems aren't very useful in astronomy due to very poor image quality aside of some top shelf or more modern cameras that are actually very good at video astronomy and similar usages. Going with the progress of technology we now have AHD cameras - analogue cameras with higher 720p or 1080p resolution. They cost only 7-15 USD but are they any good and how can we use them?